The mission of the Glassboro Fire Department is to actively promote, deliver, and preserve, with pride and dedication, a feeling of security, safety and a quality level of service to the citizens of our community. To accomplish this, the department provides a full range of emergency service responses to such incidents as fires, hazardous materials, vehicle extrication, and other emergencies as they arise. Additionally, the department provides a number of proactive programs in fire prevention, public education, and disaster preparedness. The Glassboro Fire Department covers a response area of 9.2 square miles with a population of 20,000 residents, which swells to approx. 35,000 residents when Rowan University is in full service, and responds to over 1,500 calls for service annually. In addition, the Bureau of Fire Prevention performs fire safety inspections in the business community as well as the private sector. Members of the Glassboro Fire Department work hard to promote fire safety during Fire Prevention Week and throughout the year. They host an open house for the public, work with our school children to promote fire safety, and also host a yearly Christmas party for all the Borough children. Service to the community is provided from one centrally located station, 27 East High Street. Equipment housed at this location include one 100’ Aerial Platform, one Rescue Squad, two Class “A” pumpers, a Utility Truck, and two Command Vehicle. In addition to the resources identified above, the department participates in a countywide mutual aid system, which increases the total amount of resources immediately available. 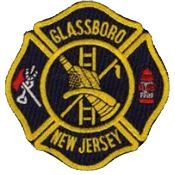 The Glassboro Fire Department is a combination career/volunteer department. The station is covered 24/7 by a mixture of career and volunteer personnel. Our staff currently consists of a full-time Department Chief, a full-time Deputy Chief, 2 full-time Captains, 5 full-time firefighters, 8 part-time firefighters, and approximately 20 volunteers. Whether paid or volunteer, the members of the Glassboro Fire Department stand by the department core values. These are: Recognizing the dedication, skill and value of all members, we will create and maintain an environment of individual safety, well being, and trust. We are guided by service to others, team work, compassion, integrity, safety, honesty, accountability, professionalism and respect.